Shipping and cargo logistics is a complex business. Start your little stevedore off in style. Kids everywhere can reel off a handful of train names (think Thomas, Gordon and Percy) but soon they may be equally obsessed with Emma Maersk, Arctic Princess and TI Asia, three of the largest cargo ships in the world. 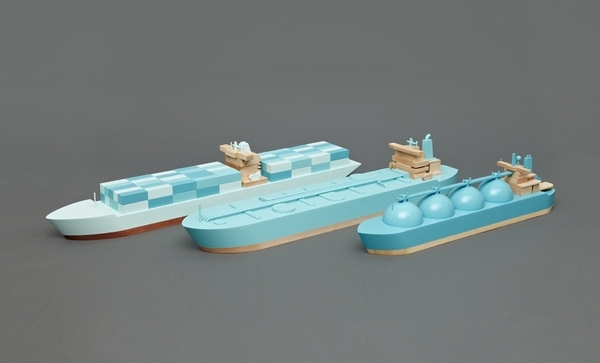 The Wooden Giants models introduce classic cargo ships to children, with a good deal of style on the side. The cool grey and blue colour palette is superb, making these boats almost too pretty to play with. Created by London-based design studio PostlerFerguson, the wooden cargo ships will be the first of a series of toys to be marketed under the brand Papa Foxtrot. The designers are marrying the traditional aesthetic of wooden toys with the technological marvels of the modern world – expect submarines, satellites, windmills, oil rigs and more from Papa Foxtrot in the future. Although not available yet, the cargo ships are expected to be in the range of £40-60 each.